A visit to the Pennsylvania Amish country can be a rewarding and fascinating experience. From tranquil Amish farms and the clip-clop of horse-drawn buggies to energy-producing windmills and tasty Amish foods, there are plenty of opportunities for a glimpse into the Amish way of life. However, while visiting Amish country, it is very important to be considerate of the Amish and their lifestyle. Just like you, they do not solicit or encourage people to take their picture or knock on their door. The Amish are private people who avoid as much contact with strangers and the "outside world" as possible for important religious and cultural reasons. When visiting their community, please keep the following basic courtesy rules in mind. "While you talk and mingle with the Amish, please remember that they are not actors or spectacles, but ordinary people who choose a different way of life." Don't stare, gawk, or otherwise be disrespectful of the Amish, and do not enter private property without permission. When driving, keep an eye out for slow-moving Amish buggies (especially at night), and give them plenty of room when following or passing. Out of respect for their privacy, it is best to avoid approaching the Amish unless they appear open to company. They are just like you and don't really appreciate strangers knocking at their door. When you do have a need to approach a group of Amish, it is polite to speak to a male, if possible. If you are sincerely interested in talking to the Amish to learn more about their culture, then your best bet is to patronize an Amish-owned business and talk with the shopkeepers. As the Amish don't use technology, you should avoid taking photos or videos of them as it's considered rude to use technology in their presence. Most Amish consider posing for photographs to be an unacceptable act of pride and do not allow pictures of themselves. The Amish will usually allow you to photograph their homes, farms, and buggies if you ask respectfully, but even this can be intrusive and is better avoided. If you must take pictures, consider a telephoto lens, and avoid taking any photos which include recognizable faces. 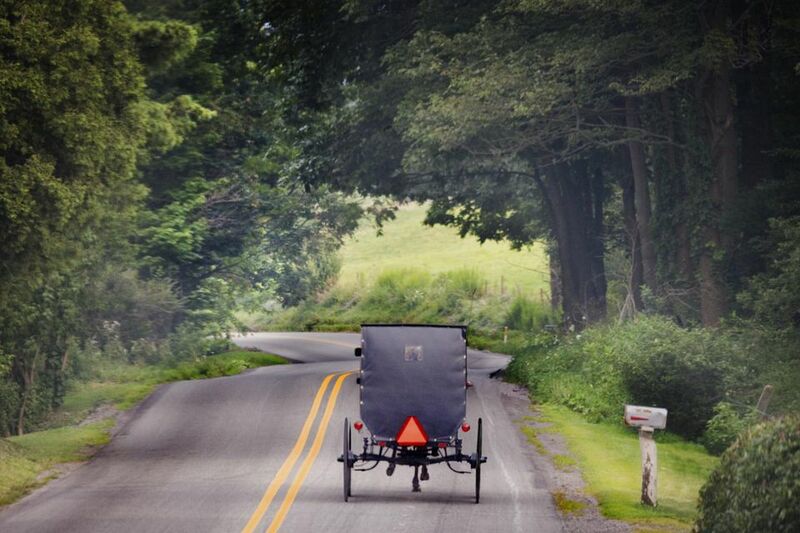 A picture of the rear of an Amish buggy as it travels down the road probably won't offend anyone. Speaking of buggies, don't feed or pet the horses that are tied to a hitching rail or harnessed to a buggy. Also, keep in mind that some Amish communities' shops and attractions may not be open on Sundays, so call ahead and plan accordingly. There are several Amish communities throughout Pennsylvania, but the towns of New Wilmington and Volant in Lawrence County, north of Pittsburgh, have the biggest concentration of these people. You can shop for local Amish-made goods and furniture, stay overnight at a quaint bed and breakfast tucked under an authentic Amish quilt, stop by local roadside stands set up by the Amish to sell excess farm produce, or explore the scenic countryside on a horse and buggy tour. There are Amish communities in Ohio and Indiana, but the largest in the country are in Pennsylvania's Lancaster ​County, which contains over 36,900 Amish people as of 2017.